I have never been a good golfer. In fact, I have not played in four years. However, my dad introduced me to the game as a young man and the one thing I do have is a respect for the traditions of the game of golf. As a high school guy, I had the opportunity to attend the PGA National Team Championship at Laurel Valley here in Western Pa. Dr. Anthony Nicolette and his two sons Richard and John were all friends of mine from the neighborhood and Dr. Nicolette was Arnold Palmer’s eye doctor. When the team event was at Laurel Valley, Dr. Nicolette piled us all into his car and off we went to see the best golfers in the world compete. It was there that I had the chance to meet the great Arnold Palmer. Mr. Palmer to us. Golf: Thunderbird Classic Invitational: Arnold Palmer smoking cigarette during Friday play at Westchester CC. 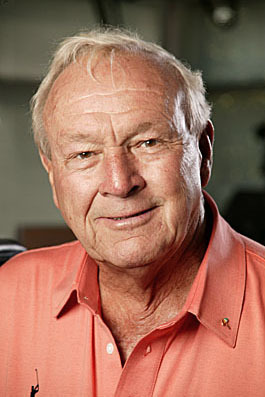 As young bucks, Richard and John and I were star struck as Mr.Palmer conversed with their dad. Doc N then always introduced us and with an intent, interested, look, Mr. Palmer shook our hand and asked how we were enjoying the day. His handshake was strong and his demeanor sincere as if we were all he had to think about at that moment. We were part of his army and he wanted to make sure we were having a good time. A few years later, I had the opportunity to marshall at the US. Open at Oakmont. I have posted on the experience before but I remember Johnny Miller floating up the fairway in total concentration looking at no one in the gallery. Jack Nicklaus stared down most people in the gallery with a competitive steely eyed look that almost made you feel uncomfortable. Arnold Palmer, on the other hand, stopped to talk to all of the marshalls on our hole while waiting to take his shot. I remember him asking me where I was from and again, was I enjoying the tournament? Arnold Palmer, asking me, if I was having a good time while he was in the thick of the hunt for the US Open! That is the kind of guy he was and we lost a good man this week in Western Pennsylvania when he passed away on Sunday. 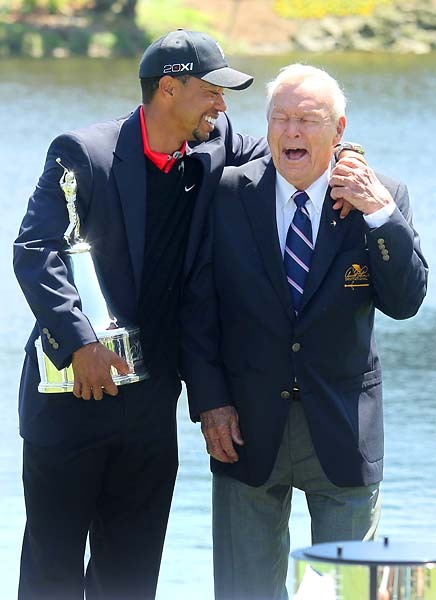 25 MAR 2013: Tiger Woods shares a laugh with Arnold Palmer as Woods holds the Arnold Palmer Invitational trophy after winning the Arnold Palmer Invitational at Arnold Palmer’s Bay Hill Club & Lodge in Orlando, Florida. There has been a lot written about the man this week by some very eloquent journalists and folks who knew Arnold Palmer very well. I do know he was a kind man, a benevolent person with the March of Dimes and building a children’s hospital in Orlando. I know he was a mentor to young players for many years including Tiger Woods. But as the writers say, he made golf accessible to the common man. This included young guys like Richard and John and me who were amazed at the time that he afforded to us and his friendly relationship with his eye doctor with whom no request was too much. He made sure Doc Nicolette was given primary parking, marshalling duties with Laurel Valley attire, dining privileges and on and on, personally attended to by Arnold Palmer himself. He took care of Doc Nicolette and didn’t leave it up to his assistant. That is the kind of person we saw when we had interaction with this legend from Latrobe, Pa. He is gone now. But his legacy will live on and his benevolence for charitable causes will also continue because of his personal attention to detail. No wonder the “army” followed him faithfully years into his career. You always knew where Palmer was on the course. Richard and John and I have him etched in our memory forever because of his kindness to us and his eye doctor. RIP Mr. Arnold Palmer. Thanks for reading. This entry was posted in Golf, Inspiration, Motivation, Pittsburgh and tagged Arnold Palmer, Golf, Laurel Valley Golf Club, Oakmont Country Club. Not sure why I am surprised that you had a personal story related to this. 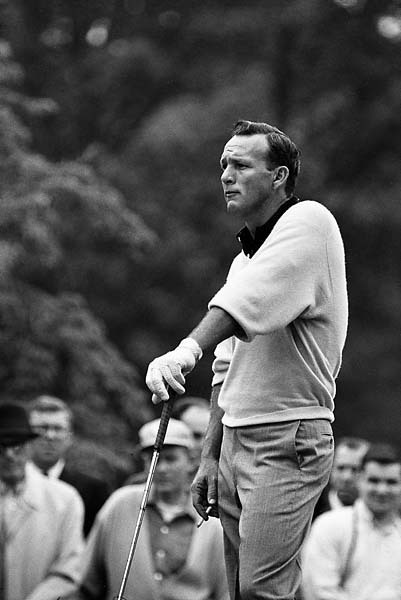 One of the best ever–not only as a golfer, but as a person. A tremendous ambassador for the game. I highly doubt we will ever see the likes of him again. Everyone loved him and he’ll be missed for sure a definite legend, so cool that you got to meet him like that. Great post Pat! 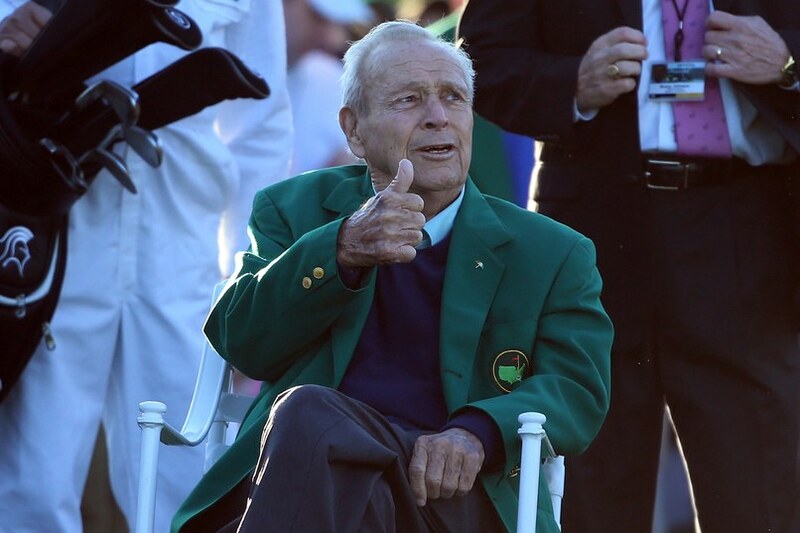 Thanks for sharing your memories of Mr. Palmer. Pat what a gift that you and your crew had ,to have such a personal interaction with Mr. Palmer a real treasure to be sure . The King! What else can you say about a man who had such appeal! A great man who made many contributions. You were lucky to have met him Pat.